Art Prize Announces the Winners of $500,000 in Awards! 1,550 artists vied for a combination of public vote and juried awards throughout ArtPrize Seven, and tonight the winners of $500,000 were revealed. GRAND RAPIDS, Michigan, October 9, 2015 -- ArtPrize, the radically open international art competition decided by public vote and expert jury, tonight held the Seventh Annual ArtPrize awards, revealing the winners of $500,000 in prizes. The Grand Rapids Civic Theatre was filled with event supporters and collaborators, to honor the artists who shared their work with hundreds of thousands of visitors during ArtPrize Seven. Two $200,000 Grand Prizes were awarded -- through public vote to Northwood Awakening by Loveless PhotoFiber, and by a jury of art experts to Higher Ground by Kate Gilmore. Since September 23, 35,481 visitors cast 422,763 votes across two rounds of the Public Vote, surpassing 2014 totals by more than 24,000 votes, and awarding Northwood Awakening -- a large photographic print and quilt hybrid, depicting a serene woodland panorama, that seamlessly blends the combined textile and photo skills of Loveless PhotoFiber -- the $200,000 Public Vote Grand Prize. Ann Loveless, ArtPrize 2013 Public Vote Grand Prize winner for Sleeping Bear Dune Lakeshore, returned to ArtPrize Seven alongside husband, Steven Loveless for the collaborative piece that won the hearts of the public at ArtPrize Seven. The ArtPrize Seven Grand Prize Jurors -- including Chicago-based artist Michael Rakowitz; Prospect New Orleans founder Dan Cameron; and Director of Virginia Commonwealth University’s new Institute for Contemporary Art, Lisa Freiman -- spent a whirlwind three days in Grand Rapids viewing each entry on the Category Award Jurors’ shortlists -- five entries from each category revealed on September 28 at the Jurors’ Shortlist Announcement. They selected the transformational performance that Sarah Shultz likened to “meeting someone and falling in love” -- Higher Ground by Kate Gilmore. Gilmore will take home the $200,000 Juried Grand Prize, presented by Kendall College of Art & Design. ArtPrize is an international art competition, open to any artist and decided by public vote. It invites artists to try out new ideas on a large and diverse population of people. It seeks to broaden the critical dialogue around contemporary art by awarding the world’s largest art prize. Two $200,000 awards are decided by public vote and expert jury, and an additional $100,000 in prizes is awarded to the top entries in each category. Registered artists and venues connect online at artprize.org and agree to present the artwork for public display during the 19-day event. The public votes using mobile devices and the web to distribute their awards, while a group of international art experts determines the winners of the juried awards. ArtPrize Seven will include 1,550 entries representing 48 countries and 42 U.S. states and territories. ArtPrize 2014 attracted more than 400,000 active participants. Since its inception, individuals of all backgrounds have cast more than 2.4 million votes for public art. ArtPrize is made possible in part through the generous support of many organizations. The 2015 Corporate Leadership sponsors include Amway, Founders Brewing Company, Kendall College of Art and Design of Ferris State University, Meijer, PNC Bank, West Michigan Honda Dealers, and X-Rite Pantone. Premier sponsors include Consumers Energy; CWD Real Estate Investment; DTE Energy Foundation, Deloitte; Edward Jones; Haworth; The Iserv Company; ITC, Your Energy Superhighway; Steelcase; and Wolverine Worldwide. 2015 Leading Foundation Supporters include The Richard and Helen DeVos Foundation, The Daniel and Pamella DeVos Foundation, The Douglas and Maria DeVos Foundation, The Frey Foundation, CDV5 Foundation, and the Michigan Council for Arts and Cultural Affairs. 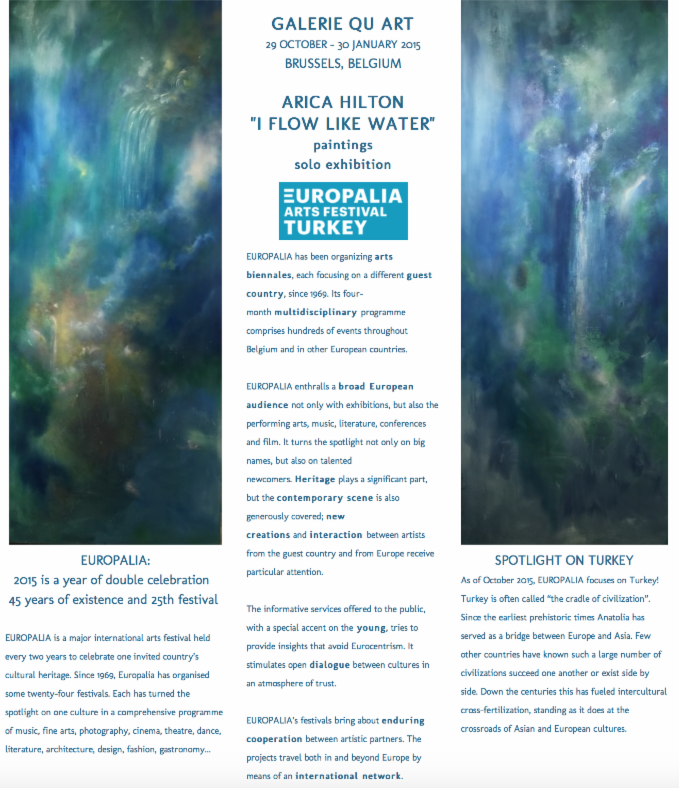 You are cordially invited to attend a preview of my paintings for my upcoming solo exhibition "I FLOW LIKE WATER" today (Friday, October 9th) from 5:30 to 8:00 pm at Hilton | Asmus Contemporary before the artwork is shipped to Europe. For many months, in addition to running Hilton | Asmus Contemporary, launching Hilton | Asmus Foto, curating nonstop photography exhibitions and designing an online store, I have quietly been working in the wee hours of the night (or morning) on a body of paintings that will be featured in a solo exhibition at Europalia Arts Festival (a biennale in Brussels opening this month) at Galerie Qu Art the end of October. 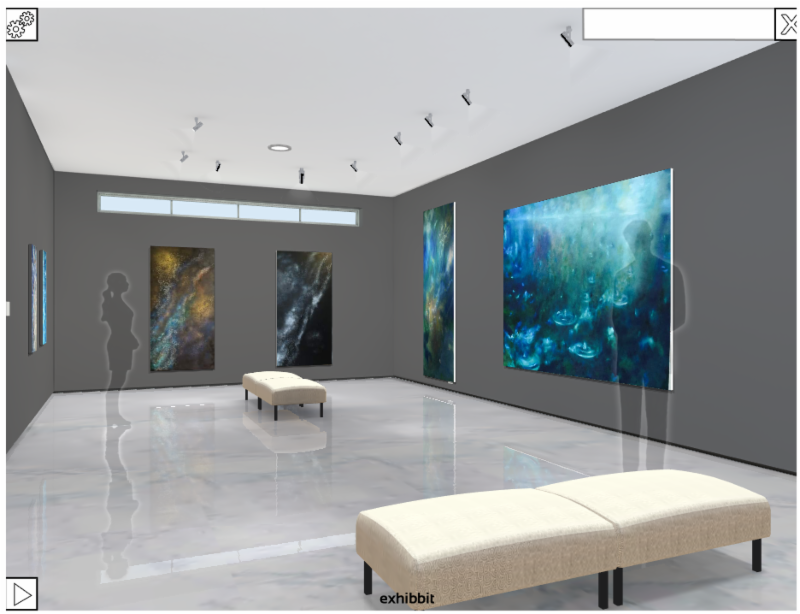 The paintings were inspired by my ongoing fascination and respect for water and the environment which has been an integral part of my life and work for quite some time. I created a series of paintings infused with recycled plastic water bottles that I actually drank from! Please join me for some wine, Lagunitas beer and my mother's baklava (made with pistachios and rose water) in my studio at Hilton Asmus Contemporary. I would love to share with you my latest works before they are shipped off to Brussels on Monday. And, of course, you can still have a chance to see the documentary exhibition "Visions of a Magic Time" with Pattie Boyd, Henry Diltz and Carinthia West when you arrive. Below are details of my show along with information about Europalia Arts Festival and my gallery in Brussels, Galerie Qu Art. Looking forward to seeing you this Friday evening! October is Domestic Violence Awareness month. It's estimated that more than 40 million people are survivors of sexual abuse in America. Domestic abuse survivor and author, Deanne Foster, has one message for anyone who suspects someone they know may be in an abusive relationship … do something. "I was a happy, well-adjusted little girl. I was living in a fairy-book reality until the day I was snatched. I found my dream world being shattered when I was awakened and grabbed by a man I didn't know,” says Deanne, who shares her own story of childhood sexual abuse in Scared Girls Talk, a free eBook available at ScaredGirlsTalk.com. Domestic abuse can include a wide number of acts including: sexual abuse, physical abuse, mental abuse, stalking, and can impact children, teens and adults. Attacks are oftentimes by family members or people known to the victim. In many cases involving children, the abusers are the very people that are supposed to protect them. • Every 9 seconds in the US, a woman is assaulted or beaten. • 1 in 3 women and 1 in 4 men will be victims of domestic violence in their lifetime. • 1 in 7 women and 1 in 18 men have been stalked by an intimate partner to the point of being fearful of being harmed or killed. • On average, domestic violence hotlines receive 20,000 calls per day. • 1 in 15 children are exposed to domestic violence and 90% of these children are eyewitnesses to the act. Within the pages of Scared Girls Talk are words of raw truth. Deanne Foster's life story is that of a victim that survived against all odds. Once a young girl, stripped of her innocence, she is now a woman of character and strength. She's a survivor and through her story, her aim is to save others from becoming victims, stop the cycle of abuse and break the silence that stifles them. Available at www.ScaredGirlsTalk.com (Free eBook). Wednesday, October 21 - 7:00pm Directors Charlie Kaufman and Duke Johnson in attendance! Catch the acclaimed stop motion animated drama, Anomalisa featuring the voices of Jennifer Jason Leigh, Tom Noonan and David Thewlis. The darkly comedic and surreal journey of a man's long night of the soul confirms Charlie Kaufman's place amongst the most important of American filmmakers, and announces Duke Johnson as a major creative force. Tickets and info! Tuesday, October 27 - 8:15pm Remember tells the story of Zev Guttman (Academy Award®-winner Christopher Plummer), a 90-year-old struggling with memory loss who is living out his final years in a serene retirement home. Also featuring Academy Award®-winner Martin Landau with director Atom Egoyan scheduled to attend!Courtesy of A24. Read more. Our competitive LGBTQ+ themed program showcases new artistic perspectives on sexuality and identity. From Oscar hopefuls with big stars to first-time filmmakers of international indies, films in the international OUT-Look program compete for the Chicago International Film Festival's Q Hugo Award. Tickets and full lineup. Cinema of the Americas Program! This year our Cinema of the America's program features innovative, vibrant and very powerful visions and stories produced by Mexican, Central and South American and Caribbean filmmakers. Don't miss these 25 films from Brazil, Chile, Colombia, Cuba, Mexico, Peru, and Uruguay, including nine US premieres. Full lineup. One of the greatest parts about the Chicago International Film Festival is hearing from the filmmakers themselves. Check out our full lineup of visiting directors and actors and don't miss these Q&A's. Full list here. Find a FREE Festival schedule! Hey, Chicago! Keep an eye out for schedules and dedicated volunteers around your neighborhood hot-spots. Come and say hi. We'll see you tomorrow at Pilsen 2nd Friday's! Also, find your schedule inserts this weekend in the publications below. "Wansas, meaning "to discover unexpectedly", is the driving philosophy behind our brand and lifestyle. We are thrilled to support the 51st Chicago International Film Festival, an organization that creates opportunities for film audiences to discover unexpectedly each year. We are also honored to sponsor the Cinema of the Americas Program, showcasing the best filmmaking talent from South and Central America, Mexico, and the Caribbean." "NCM is America's Movie Network, bringing brands and moviegoers together for a "FirstLook" at what's next in entertainment. Every day, NCM celebrates the inspiration and imagination of movies and filmmakers, and that's why we're excited to be a returning sponsor of the Chicago International Film Festival." "After you've watched some of this year's best films at the Chicago International Film Festival, try out a 30 day free trial of SundanceNow Doc Club a new streaming service dedicated exclusively to the world's best documentaries, with guest curators like Ira Glass, Susan Sarandon, and Dan Savage. a new streaming service dedicated exclusively to the world's best documentaries, with guest curators like Ira Glass, Susan Sarandon, and Dan Savage. SundanceNow Doc Club is a proud sponsor of the 51st Chicago International Film Festival." 51st Chicago International Film Festival would not be possible. Cinema/Chicago, the presenting organization of the Chicago International Film Festival, is a year-round non-profit cultural and educational organization dedicated to fostering better communication between people of diverse cultures through the art of film and the moving image. We serve Chicago's diverse and under-served citizenry by providing access to world-class cinema. We aim to enrich Chicago's cultural environment by presenting film in contexts that encourage discussion and debate.